The Real-Time Trend Trading Experiment began as and still is an Academic Project to publish the hypothetical returns of a classic systematic trend trading approach on a portfolio of the most heavily-traded domestic US futures markets. Historically speaking, the CTA industry has been dominated by managers utilizing "Trend Trading" techniques, although more and more firms these days have morphed into multiple-strategy firms. It is very easy to measure Alpha (or the excess return of an investment relative to a benchmark) in the stock market, because the S&P 500 is such a widely-accepted barometer. By contrast, computing Alpha in the Alternative Assets (or CTA) space is a much more difficult endeavor because there is not a single widely-acceptable barometer of returns. Of the indices which are available, they may be slow to report, carry potentially misleading risks such as: survivorship bias, selection bias, backfill bias, and may be about as transparent as mud. We created this Index not only to help educate people on basic Trend Trading principles through repeated examples, but to make a more useful and timely index useful in comparing manager or strategy performance to that of a classic and pure trend trading philosophy. Every minute of every trading day - from 7am to 3pm since the beginning of 2014 - we have been using our computers to assess the trading signals of a very simple trend trading program. Trade signals have been timestamped and monitored from cradle to grave, allowing us to compile the hypothetical return stream with a high-level of accountability and transparency. 4. 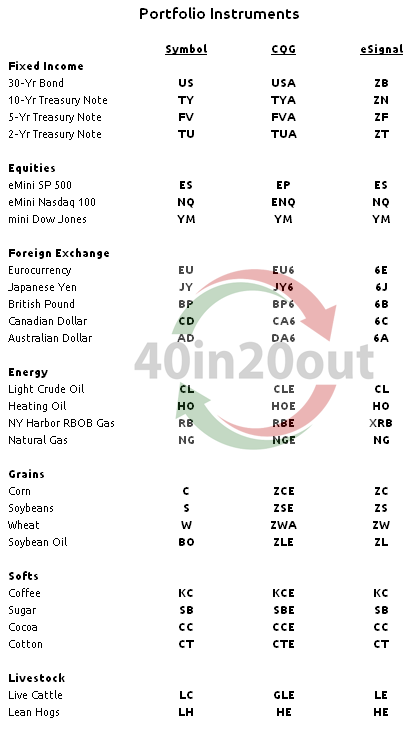 Why the name "40in20out"? The name will make perfect sense once you have a firm grip of basic trend following strategies and the parameter set we are using. Before you have your "lightbulb moment", it may seem a little silly. Hang in there! 5. What instruments are traded in the Model Portfolio? What are their symbols? 6. 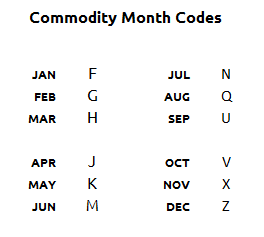 What is a "Month Code"? The ticker for each instrument traded consists of the root Commodity Code + a Month Code and Year Code to denote the expiration of the futures contract. For example, Crude Oil expiring in Dec 2019 would have the code: CLZ9, or CL Z9, or CL Z19 depending on who you ask and their symbology. In CQG, the symbol for Crude is CLE. So, Decmber 2019 Crude becomes CLEZ19. 7. Do you have an App for that? Push notifications? We do have an app, and it does have PUSH notifications! But, we hope you are fans of Android because we have not ported this to Apple yet. You can find the official 40in20out app in the Google Play Store here. You will need to be registered in order to get full access to the data.